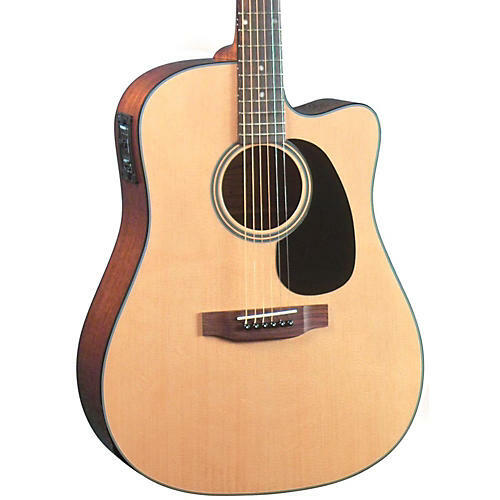 The Blueridge BR-40CE cutaway dreadnought acoustic-electric guitar is one of the most popular guitars of the Blueridge Contemporary line to receive a modern face-lift. Every detail makes for easy playability and big, powerful tone. The solid Sitka spruce top is dynamic and powerful; meanwhile the mahogany back and sides offer extraordinary texture. Gorgeous accouterments like 5-ply body binding, mother-of-pearl inlays and nickel-plated Kluson-style tuners. Authentic pre-war bracing ensures tone and volume just like the finest vintage guitars. Add to this a deep cutaway and a state-of-the-art pickup system by Fishman and you've got a guitar that's perfect for every performance.